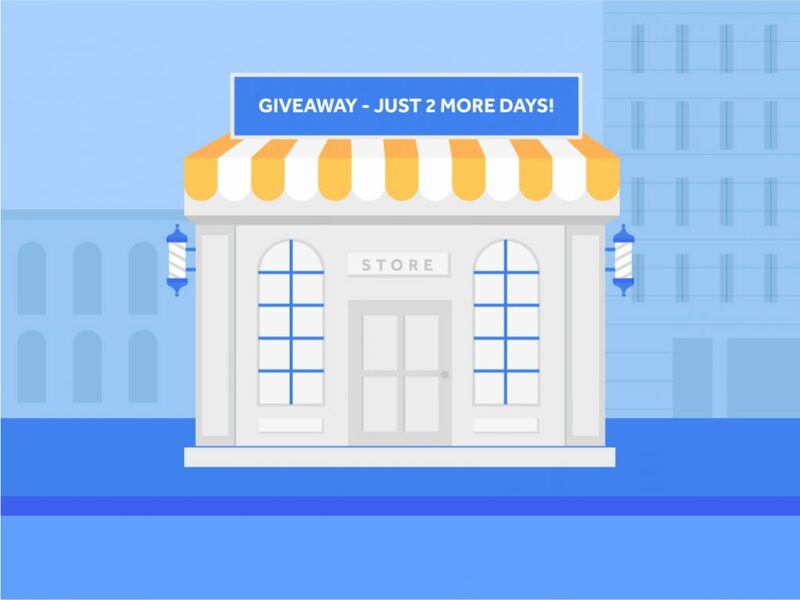 Although the entire online marketing landscape has been changing countless times over the last decade, the concept of giveaways is still among the most potent social media marketing and blog strategies you can utilize to promote your products and/or services and gain visibility among your target audience. With the sudden rise of social media popularity and mobile internet traffic, creating a successful, dynamic, and mobile-responsive giveaway campaign is now more vital than ever. – What is the goal of my giveaway? – Who is my ideal target persona? – How long should my giveaway run? For those curious about this article’s titular question, we will first cover the optimal length and giveaway time, and later address all the other aspects of a successful giveaway campaign. I) How Long Should a Giveaway Run? Even though the magic number doesn’t really exist, as the equation largely depends on numerous factors including: your target audience, your niche, the social media platform(s) you will be using, the product you offer, what your end goal is, how much time and which resources you can afford; there ARE ways to make an informed decision about the length of your giveaway. It’s all about trial and error. After years of experimenting and countless successful giveaway campaigns behind us, we’ve managed to accumulate enough data-driven knowledge so we can help you make an educated guess about how long your giveaway should last. Though there’s no perfect formula for putting in that tricky end date, you can still find the sweet spot that is specific for your unique needs. So, how long should a giveaway run? The main thing about this type of outreach is the fact that you need to make sure your offer spreads like wildfire and that you pop up in as many news feeds as possible. Giveaways are, in their essence, a numbers game – the more people see your offer, the higher your chances are to acquire new clients. But this is extremely hard to achieve in just 7 days. Two weeks (14 days) might be the optimal time to run a giveaway. It gives you enough time to pick up where the previous method fails, and it is not too long to make your target audience forget about your brand/product/offer. This is actually the most popular giveaway running time, as this period provides an optimal amount of time to reach enough potential clients, while still keeping your campaign dynamic, relevant, and exciting. – do the last minute frenzy toward the very end of your giveaway campaign. Depending on the size of your giveaway, the expected engagement, and type of service/product you are offering, a two-week period may turn out to be insufficient for your promotion to spread and grow the way you want it to. This gives you an extra opportunity to go into a promotional frenzy that doesn’t feel forced and helps you to keep your giveaway relevant much longer. A run that is this long also leaves more room for your promotion to become idle and lose its engagement. Pretty much everything we said about the previous method goes for this one too, but even more emphasized. If you choose to run a giveaway for, let’s say, 3 months, you will have more than enough time to iron out possible mistakes and pick up entrants in a steady way. Should you play your cards right, more time can result in more potential clients. As you can probably assume, a timeframe this long usually isn’t as effective as one might think. It robs your campaign of a sense of urgency, thus making your target audience feel like they have more than enough time to participate, which can make your potential entrants postpone any type of engagement, and ultimately lead to losing interest in your giveaway. This usually results in spending more money on promotion and boosts that would hopefully pick up your giveaway campaign. Efforts that, in most cases, prove futile. 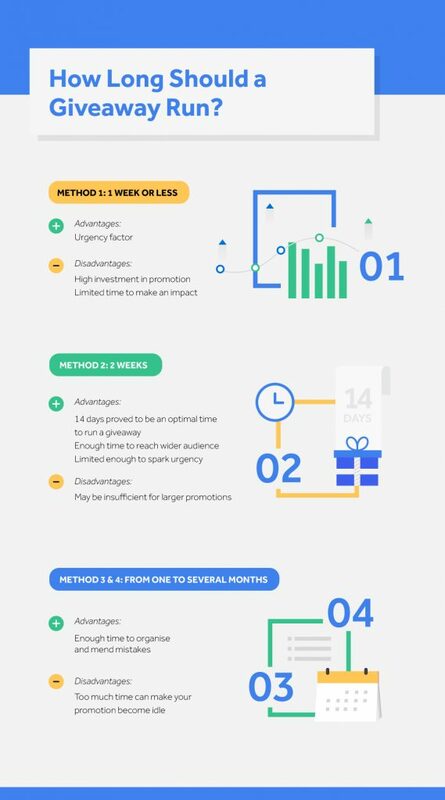 Although each giveaway campaign requires a unique approach in terms of marketing strategy, a two-week campaign has proven to be the most optimal solution. Whether it is a service, a product, or a blog giveaway, 14 days is the sweet spot as it provides enough time to keep your campaign alive, relevant and exciting, without leaving much room for the sense of urgency to drop beyond repair. Our research also suggests that most giveaway campaigns yield the best results in terms of volume and quality of entrants within the first and the last 3 days of your campaign. This means that the middle part typically isn’t as productive as the beginning and the end, therefore a 2-week promotional period provides an optimal gap between the two engagement peaks. II) Giveaway Time: When Should a Giveaway Start? Determining how long should your giveaway last is just one part of the puzzle. You also need to think about when your audience is online and most likely to participate in your giveaway. So, we’re talking about giveaway time. Having in mind the great content saturation, people often feel overwhelmed with the amount of information they get exposed to on a daily level. This is why it’s crucial to design your giveaway to be eye-catching and unique, but also to consider its timing. But, how do you actually figure out the best timing for your giveaway? Are there any major events or holidays coming up that may push down the visibility of your giveaway and leave it forgotten? You won’t get much traction if you launch your giveaway campaign during major events and holidays such as Super Bowl weekend or Christmas, as consumers focus on other things during these times or they might even be away from their computers. Your focus should be to get the most engagement from your entrants, which is a hard task if their attention is elsewhere. If you still want to take advantage of the hype around a certain event, it is doable. Just ensure you don’t end your giveaway on the exact date of some big event, but rather a couple of days before or after. If you plan on making giveaways an integral part of your business strategy, you can expect great results, especially in terms of higher visibility online, stronger relationships with your audience, and improved engagement rates. Many organizations and individuals who collaborate with brands choose to run monthly giveaways, which is smart as it creates a habit for your followers. As people get used to you launching a giveaway, let’s say on every first Wednesday in month – they will pay closer attention to your brand and probably recommend you to their personal network. There is hardly a better way to get more exposure for yourself than word-of-mouth. In terms of promotion across social media, you can even launch an official hashtag that indicates the day when you’ll be launching the giveaway. This will help you get discovered easier and generate the much-needed buzz. As you can see, giveaway timing is everything. To get the most entries during the weekdays, launch your giveaway either between 9AM and 10AM or between 8PM and midnight. Most of people get the day rolling by surfing the web and catching up with the latest news, and choose to unwind in the similar way before bedtime, so that’s when your chances of catching their attention are the highest. Similar to weekdays, on weekends – you can expect the highest number of entries in the period between 8PM and midnight. These are usually the peaks of audience activity online that align with the slower tempo people take during relaxation times on weekends. Looking for a shorter answer regarding the timing of your giveaway? Well, Mondays and Tuesdays are typically the best days to launch and promote your giveaway, preferably somewhere in the evening (9PM – 11PM). Of course, you should think about your target audience and their time zone in order to get the best results. Naturally, the duration isn’t the only aspect of your upcoming giveaway strategy you should tackle carefully. To boost brand awareness and bring in new customers quickly, make sure all the puzzle pieces fit in perfectly. That being said, here are some actionable tips that can help you create a successful social media or blog-related contest. Before you start coming up with a potent strategy, you need to think about the primary focus of your campaign – Is your main goal social media engagement boost? More followers on Twitter, Instagram, and Facebook, perhaps? Or maybe you are trying to utilize giveaways for your link building endeavors? The end goal is vital for determining the right strategy and the budget for your contest. Give your upcoming campaign a nice head start by reaching out to the subscribers and customers that are already on your email list and ask them to participate and promote your contest. This way they will allow for a significant increase of potential new subscribers and will boost the engagement and buzz around your brand. Depending on your niche, certain social media platforms might work better for your marketing outreach strategy. Inquire about which networks work best for your product/service/blog and then focus the bulk of your boost there. One of the most potent ways to gain visibility and make sure your contest pops up in relevant news feeds is to track down prominent influencers and bloggers and ask them to promote your giveaway. Promote your giveaway and come up with a strategy that won’t come off as spammy but will get the job done. We suggest deploying a strategy based on the day of the week (especially if you are planning a blog giveaway) and organizing your posts so you are equally active each day of your giveaway period. Whether you’ve chosen to select the winner via a giveaway tool or you’ve done it manually, it is time to notify the lucky person and see if they are ok with you using their name, picture, and personal info in your Thank You for Participating emails that will be sent to other participants and will be mentioned in your official giveaway winner announcements. If everything checks out, it is time to close your campaign with official social media announcement posts and Thank You emails. These emails are a nice opportunity to convert some of the participants into customers. Consider giving them an incentive in a form of coupons and discounts, or even arrange some free goodies. Making this email as appealing as possible can be just as productive as the entire giveaway program. Your main goal is to prevent them from unsubscribing and to turn them into your potential clients. Sending out your prize in a neutral box is impersonal and boring. Be creative and turn your giveaway prize into a beautifully personalized present accompanied by a nice thank-you letter, and make your lucky customer feel special. This way they will be enticed to share their prize and tag your brand in their posts for all their friends to see. When it comes to giveaways, timing and preparation is everything. Finding the sweet spot when it comes to the duration and the frequency of promoting your giveaway campaign, can do wonders for your company/product/services/brand. All this in just two-weeks time, not bad at all. Now go ahead, create your own strategy and don’t let your giveaway slip away. Need some help along the way? Check what PromoSimple can do for you!